August 14th is National Creamsicle Day, a classic ice cream novelty on a stick that combines orange sherbet and vanilla ice cream. 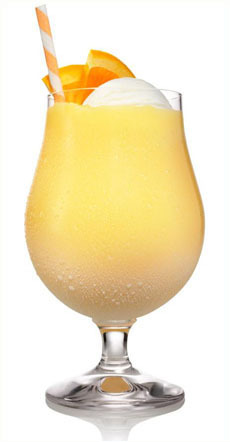 You can buy a Creamsicle, have a scoop of orange sherbet and vanilla ice cream in a dish, or enjoy this cocktail version from Svedka Vodka. It uses Svedka’s Orange cream Pop vodka, a “nostalgia flavor” and one of the company’s 11 flavored vodkas. 1. COMBINE all ingredients in a blender, adding 1/2 cup of crushed ice last. Blend until smooth and pour into a hurricane glass. 2. GARNISH with an orange wedge and a scoop of ice cream. In 1923, Frank Epperson, a 29-year-old husband and father working in the real estate industry, made what he called Epsicles for a fireman’s ball. They were a sensation, and Frank obtained a patent for “a handled, frozen confection or ice lollipop.” His kids called the treat a Popsicle, after their Pop. So Frank created Popsicle Corporation and collaborated with the Loew Movie Company for the nationwide marketing and sales of the product in movie theaters. By 1928, Epperson had earned royalties on more than 60 million Popsicles. But his happy days ended with the Great Depression. In 1929, flat broke, Frank had to liquidate his assets and sold the patent to, and his rights in, Popsicle Corporation. Over the years, the Popsicle Corporation created other frozen treats on a stick: the Fudgsicle (a chocolate-flavored pop with a texture somewhat similar to ice cream), the Creamsicle (vanilla ice cream and orange sherbet) and the Dreamsicle (a Creamsicle filled with ice milk instead of ice cream). Today, Creamsicle is the trademarked property of the Good Humor Company, owned by Unilever. Here’s more on the history of the Creamsicle, and a recipe for Creamsicle Cake.